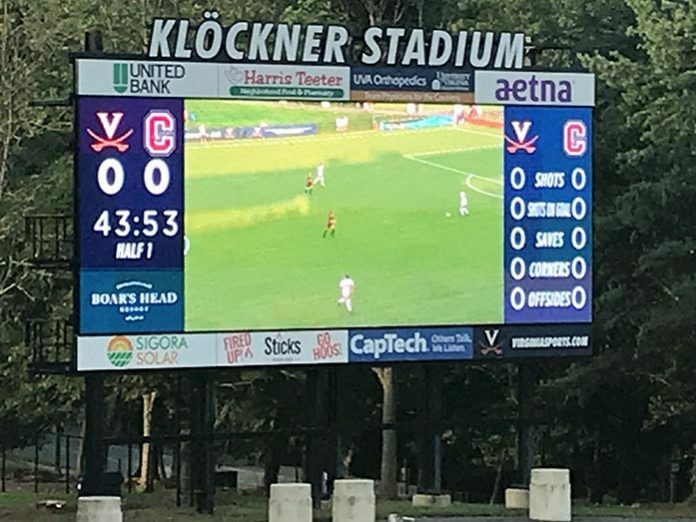 Daktronics of Brookings, South Dakota, has announced the installation of new LED displays at the University of Virginia’s (UVA) Klockner Stadium and Disharoon Park in Charlottesville, Virginia. A new main video display for soccer and lacrosse as well as a new ribbon display for baseball will entertain and inform Cavaliers fans in 2018. At Klockner Stadium, a new main LED video display measuring 17 feet high by 48 feet wide was installed this summer. It features a 15HD pixel layout for exceptional image clarity and contrast while also featuring industry-leading environmental protection for outdoor operation. At Davenport Baseball Field, the new LED ribbon display measures 3.5 feet high by 56.5 feet long to bring additional game-day elements to every event. This display features the same 15HD pixel layout as the display at Klockner Stadium. It will be used to bring closed captioning to Cavalier baseball fans while also providing the opportunity to highlight sponsors throughout events. The video display for soccer and lacrosse is capable of variable content zoning allowing it to show one large image or to be divided into multiple zones to show any combination of live video, instant replay, statistics and other game information, graphics and animations, and sponsorship messages.